GENEVA, May 25, 2018 (GLOBE NEWSWIRE) -- Ellisys, a leading provider of test, certification, and analysis solutions for Bluetooth®, Universal Serial Bus (USB), Wi-Fi®, and other technologies, today introduced its latest and most advanced Bluetooth analysis solution, the Bluetooth Vanguard™. 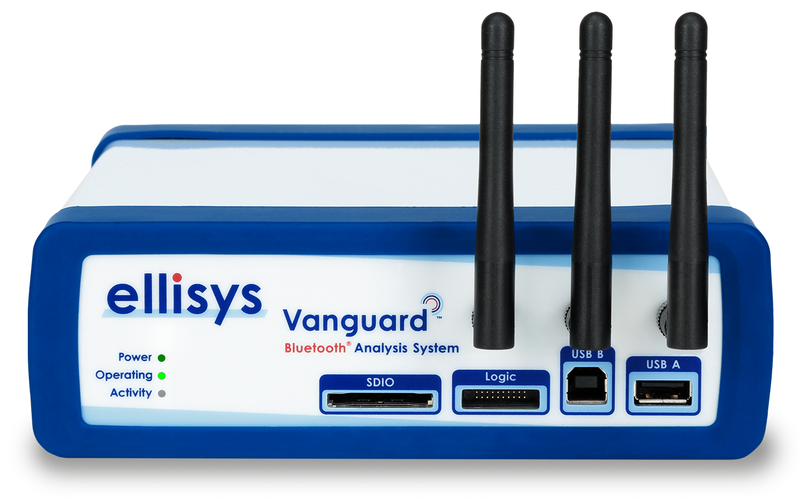 Vanguard builds on a rich legacy of innovation from Ellisys, adding features that address the recent, rapid evolution of Bluetooth technology and related development complexities, including feature additions for Wi-Fi and WPAN coexistence analysis. Vanguard is an all-in-one, fully integrated system supporting wideband (all channels) capture and analysis of Bluetooth Classic (BR/EDR), Bluetooth Low Energy (LE), plus concurrent Wi-Fi 3x3 11ac, all 16 WPAN (IEEE 802.15.4) 2.4 GHz channels, raw ISM spectrum capture, Bluetooth host controller interface (HCI) protocols (USB, UART, and SPI), Audio I2S, WCI-2, and generic protocols including UART, SPI, I2C and SWD, all visualized over the widely adopted Ellisys software suite. Bluetooth Vanguard will be on Display at the Bluetooth Asia 2018, Shenzhen Convention & Exhibition Center, Shenzhen, China, booth 31, May 30-31, 2018. A recognized hallmark of Ellisys Bluetooth protocol analyzer products is comprehensive hardware integration, borne of properly considered initial design requirements. Such tight integration provides not just user conveniences, but also results in unrivalled precision and predictability for timing synchronization among the multitude of wired and wireless communications captured. Stack and hardware behaviors are dependent on myriad timing relationships, and the ability to precisely characterize these timings is paramount for Bluetooth design and validation teams. For example, characterizations of Bluetooth packet timings relative to Wi-Fi or to HCI traffic can be critical to developers seeking to optimize designs for certification requirements, interoperability, and performance criteria. One of the biggest challenges facing Bluetooth developers is understanding the busy 2.4 GHz ISM (Industrial Scientific-Medical) band associated with Bluetooth communications and other emitters, including Wi-Fi. The Bluetooth specification provides an adaptive channel avoidance feature that can be used to optimize communications by avoiding channels where packets are experiencing a higher error rate, often due to the emissions of other wireless devices, even co-resident radios (on the same SoC). Bluetooth Vanguard provides various features to enable precise understandings of spectrum and channel usage by devices and a host of other features specific to coexistence testing. These features include a raw RF capture of the ISM spectrum that provides precision time and power indications of Bluetooth packets and all other emissions, an Ellisys innovation. Additional features include GPIO logic capture, Wi-Fi protocol capture (IEEE 802.11 a/b/g/n/ac 3x3), WPAN capture (IEEE 802.15.4, all 16 channels), and support for the Wireless Coexistence Interface (WCI-2) Transport standard, all tightly synchronized to Bluetooth and host controller interface (HCI) packets and concurrently captured. Central to wireless coexistence testing and characterization are various correlations of Wi-Fi traffic to Bluetooth traffic, including the ability to manage streams of incoming traffic without loss. With implementations that use a software-based capture, such as those that can be done with just about any computer, the Wi-Fi capture is done with a processor involved. This limits the speed and accuracy of the capture – packets can be missed when the processor is outmatched by the incoming streams. With Vanguard, the capture is driven directly with a powerful hardware-accelerated protocol engine, to guarantee throughput and minimize latency. The Ellisys Bluetooth Vanguard is designed with a reconfigurable capture engine, an Ellisys innovation introduced with the Bluetooth Explorer™ model in 2010. This feature allows for very early addition of analyzer support for emerging Bluetooth features, well ahead of official releases in the Bluetooth specifications. For example, features peculiar to Bluetooth 5, including 2Mbps speed and LE Coded PHY extended range enhancements, were released 18 months prior to the public release of that specification. This approach enables design teams to test and perfect new Bluetooth features at an early stage, allowing for improved development cycle efficiencies and increased confidence in product quality on roll out of new radios and stacks. As the Bluetooth Special Interest Group (www.bluetooth.com) celebrates the 20-year mark from its inception in May 1998, the release of Vanguard offers a solid endorsement of the state of the technology and its future, with hardware and software configured to support both current and next-generation Bluetooth features. Ellisys, the Ellisys logo, Better Analysis, Bluetooth Explorer, Bluetooth Tracker, Bluetooth Vanguard, and Type-C Tracker are trademarks of Ellisys, and may be registered in some jurisdictions. The Bluetooth® word mark and logos are registered trademarks owned by the Bluetooth SIG, Inc. and any use of such marks by Ellisys is under license. Wi-Fi® and the Wi-Fi Alliance logo are trademarks of Wi-Fi Alliance. USB Type-C™ and USB-C™ are trademarks of USB Implementers Forum. DisplayPort and the DisplayPort logo are trademarks owned by the Video Electronics Standards Association (VESA®) in the United States and other countries. Thunderbolt and the Thunderbolt logo are trademarks of Intel Corporation in the U.S. and/or other countries. Other trademarks and trade names are those of their respective owners.